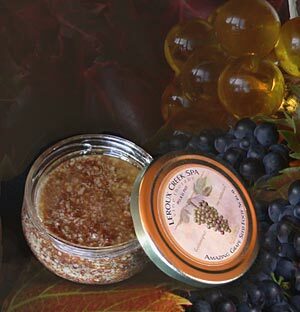 The exfoliating power of crushed grape seeds and grape seed oil, with peppermint and eucalyptus soothes tired, achy feet. Lifts away dead cells at the skin’s surface to reveal fresh, healthy skin. Ingredients: Brown Sugar, Ground Oats, Ground Grape Seeds, Grape Seed Oil, Jojoba Oil, Coconut Oil, Vit. E (T-50), Peppermint and Eucalyptus, Essential Oils, LC Spa Essence.